Gamers are going to great lengths to get their hands on Activision Publishing's Call of Duty: Modern Warfare 3 despite mixed reviews from pros and the average Joe. The company says it sold 6.5 million units worth more than $400 million in the first 24 hours of the highly anticipated game’s release. This is the third year in a row C.O.D. has set a one-day launch record, a feat no other entertainment franchise has ever done, the company says. How gamers actually like the game is an open question. While pro reviewers are giving it decent ratings, regular gamers seem to be disappointed. The Telegraph’s Ashton Raze gave the game a perfect score rating, calling it "a shining example of refinement and improvement." He predicted it's "a game which is undoubtedly going to be played for a long, long time to come, and deservedly so." But some users say the game's familiarity is its downfall. One gamer on Metacritic remembers "when a sequel to a game meant innovation." The person said that "while the mechanics work well, they offer nothing new. It is the same game as black ops with a new coat of paint." The comments aren’t stopping people -- even criminals -- from snapping up the game. According to the French site TFI News, thieves targeted and then crashed a car into a truck driving in southern Paris that was loaded with thousands of copies of Modern Warfare 3. Two individuals wearing masks emerged from the car and used tear gas to subdue the truck drivers. 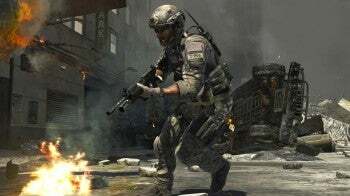 They then took off with the truck which was reported to be carrying 6000 copies of Modern Warfare 3 valued at about $550,000.